This is an in-depth insight into the world of football violence. 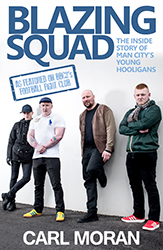 It charts the rise of one of the most notorious firms of their generation, Manchester City's Blazing Squad. From 2006 to the present day, they have been involved in countless battles up and down the country. However, as their appearance on BBC TV’s ‘Football Fight Club’ proved, the tactics required to organise fights between rival football supporters have changed hugely since the mass brawls of the 1970s and 80s. Modern policing techniques and CCTV has forced the modern day hooligan to arrange 'meets' with rival fans, typically in areas well away from grounds and often with supporters whose team are not even in action that day. The Blazing Squad are one of this new breed of football firm - small in number but ready to travel all over the country to fight their rivals. Carl Moran, star of BBC's 'Football Fight Club' explains how Blazing Squad grew from a few teenagers following their team into one of the most feared hooligan mobs of recent times. CARL MORAN is from Whitefield, Manchester. A lifelong Manchester City supporter, Carl's first brush with football violence came when he was just 16. He was, at this stage, an unlicensed boxer and turned down the opportunity to turn professional so he could continue building up 'Blazing Squad'. In 2013, the BBC made a documentary about him and a new film is currently being produced updating the exploits of many of the characters of that film. With the number of banning orders and prison sentences handed down The Blazing Squad is not as active as it once was however, as Carl makes clear, "there are always new lads coming through".